I wish all of you a Happy Fourth of July! In celebrating living in the awesome United States of America, I would like to take time to focus your attention on the wildfires in the West, particularly Colorado. I saw shocking footage of people’s homes going up in flames and it just upset me a lot. It also got me to thinking that many of you might think this is a contemporary phenomenon. Alas, no, it is not. Wildfires in the West are sadly part of American history. While historically many were started by lightning strikes, the majority were caused by Aboriginal peoples or white settlers and trappers. 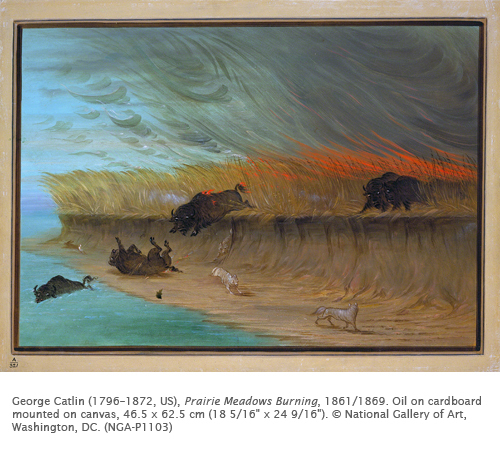 Prairie fires were all too common in the 19th century West. They burned the dry grass every spring and fall. Once a fire started, it spread until either rain fell or until it reached a river too wide to jump. This image by George Catlin shows a fire on the banks of the Missouri River in Nebraska, which he visited in the 1830s. Such fires were a great danger to early settlers, as well as to the gigantic herds of buffalo that existed then. This painting depicts the front of the fire, called a headfire. It ran with the wind across miles of prairie. Born in Pennsylvania, Catlin grew up on farms in New York, where he absorbed stories about Indians. Although he began a legal career at his father's urging, he abandoned it in 1821 to pursue a career as an artist. In 1828 he received the inspiration that guided his painting the rest of his life: a delegation of Indians from the West visiting Philadelphia. He subsequently decided to devote his life documenting Indians, whom, he felt, had no biographers of their own. 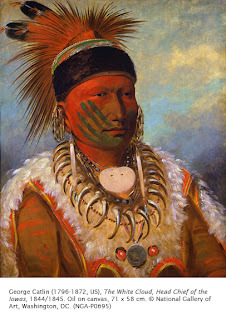 Between 1830 and 1838, Catlin traveled in the West from a base in Saint Louis for five months out of each year, painting the lives of the natives. 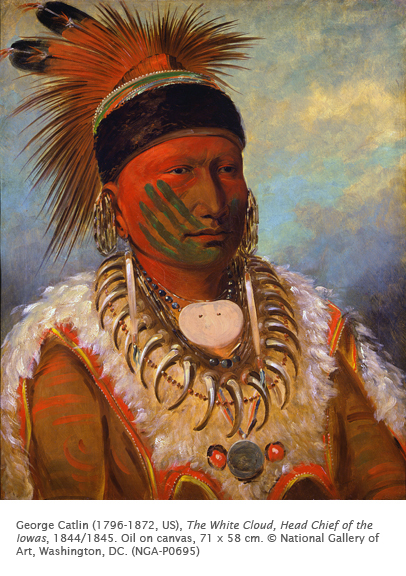 From his travels he eventually produced over 600 paintings which he exhibited in his traveling "North American Indian Gallery." In documenting First Nation peoples, he also documented elements crucial to their lives, such as the buffalo. He visited Nebraska territory in 1832. His over 600 paintings of his trips to the West not only serve to document First Nations, but also the “wilderness” that was unknown to easterners. Correlations to Davis programs: Explorations in Art Grade 2: 3.16; Explorations in Art Grade 3: 2.10; Explorations in Art Grade 4: 4.19; Explorations in Art Grade 6: 2.9; A Personal Journey: 5.1; A Community Connection: 4.4; Exploring Visual Design 5, 10.